Mainline Track bring to the contractor New Zealand’s leading auger brand ‘Auger Torque’. This comprehensive range of auger drive units to suit excavators and skid-steers are the result of many years experience in auger unit manufacturing and testing in the most arduous conditions. Auger Torque drive units are unique and special due to their innovative non-dislodgement output shaft, massive diameter bearings, huge torque ratings and top quality American hydraulic motors. Auger Torque’s drive units are setting the standard for strength and reliability and made with the best quality raw materials to create a product with Extra Power, Maximum Performance & Reliability. Manufactured from high grade materials and precision engineered components. Designed to withstand extreme working conditions. High grade synthetic gear oil used for extra protection and long service life. Planetary Gearbox Components – 72 Months. Hydraulic Motors – 36 Months. All Other Parts / Products – 12 Months. Unique design preventing shaft dropdown. Lifetime warranty against shaft dislodgement. 6 year warranty on components. 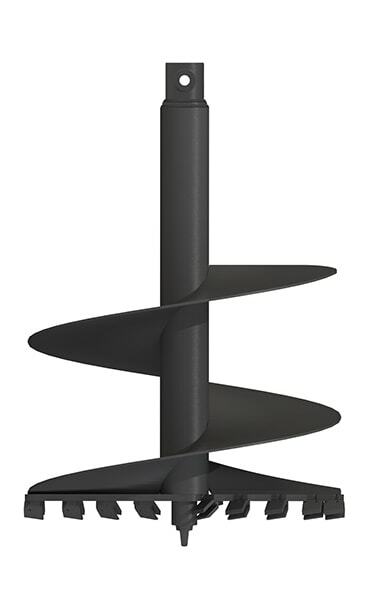 Designed, manufactured and assembled by Auger Torque. Holds earth on flights on removal. Most efficient ratio between quantity of earth removed and speed of operation. Tooth holders angled to direct spoil onto auger flights efficiently. SHOCK LOCK – PATENTED TOOTH LOCKING SYSTEM – DON’T LEAVE YOUR TEETH DOWN THE HOLE! EARTH – Best suited to soft grounds like earth and clay. TUNGSTEN – Best used in dry, hard or medium ground conditions where floating rocks may be encountered. The perfect all-rounder if you are not sure about what you might encounter. ROCK – For very hard ground and tarmac where extra cutting is needed and highwear is expected. Most effective on machines with high down pressure.